Bulgaria (officially called the Republic of Bulgaria) is a country in southeastern Europe. The capital and the biggest city is Sofia. Their money is called the lev. The Bulgarian government is a member of the European Union and NATO. The current president is Rosen Plevneliev. The population of Bulgaria is a little more than 7 million people. Bulgaria has its own language, called Bulgarian. It is a type of Slavic language. It is related to languages like Serbian and Russian. Bulgaria became independent in 1908 from the Ottoman Empire. Bulgaria borders Romania, Serbia, the Republic of Macedonia, Greece, Turkey, and the Black Sea. One of the national heroes of Bulgaria is Vasil Levski who led the fight for independence in the late 1800s. Bulgaria is an ancient country, some places have had people living there for over 6,000 years. In what is now Bulgaria, many different people and different cultures lived over time. This includes Neolithic, Hamangia culture, Vinča culture, eneolithic, Varna culture (5th millennium BC) and the Bronze Age Ezero culture. The Thracians lived in the area of modern Bulgaria. King Tere united the people in Odrysian kingdom around 500 BC. Alexander the Great had influence over the people on the 4th century and later by the Roman Empire during the time of Christ. Eurasian Avars, South Slavs and Huns settled all over the territory of modern Bulgaria during the 6th century. The first Bulgarian empire was established in 681 AD. But the first Bulgarian Empire came to fall under the pressure of the Byzantine Empire (se also Battle of Kleidion). The second Bulgarian empire started about 1185 AD, with Turnovo as the capital. But it only lasted about 70 years and there was too much fighting with their neighbors and with themselves. After a while the country separated into three parts. Then the Ottoman empire took over in 1396, and ruled Bulgaria for about 500 years. The Ottomans had very strict rules and the Bulgarians suffered. The Bulgarians rebelled several times against the Turkish rulers but did not win. After the first Balkan war (1876), Bulgaria pulled away from Ottoman Empire's influence with the help of the Russian Empire who were already fighting the Ottomans. But it was not until 1908 that the whole country of Bulgaria was united as modern Bulgaria. Bulgaria joined the side of Germany in World War I and lost. During the first year of World War II Bulgaria said it was neutral and refused to join sides with Nazi Germany or the Soviet Union. But the increased tension in the war made the leaders sign the Tripartite Pact with Germany in March 1941. This let German forces go through Bulgaria to reach Greece. However, Bulgaria did not follow Hitler's wishes. Bulgaria's troops refused to participate in military coups and also refused to send Jews to concentration camps in the Holocaust. This made Adolf Hitler very suspicious, and the king of Bulgaria, Tsar Boris III, died one day after talking to Hitler. In 1944 when it became clear that the Allied Powers would win the war, Bulgaria had to find another solution. Their leaders declared that they withdrew from the Axis forces and they let the Soviets come in. But the Soviet Union didn't respect Bulgaria's wish to be neutral. They replaced the royal monarchy with Communism in 1947 before they withdrew from Bulgaria. For 40 years, under their leader Todor Zhivkov, Bulgaria was very close to the Soviet Union and followed their instructions. Shortly after the fall of the Berlin Wall, on 10 November 1989, the Communist party gave up their rule and allowed the country to elect leaders of their own choice. But in a few years Bulgaria had serious money problems under the new socialist government. Since that time Bulgaria has recovered in many ways, and is much more stable. But it is still one of the poorest countries in Europe. Problems in the administration, a weak court system and organized crime are the biggest issues for Bulgaria. Bulgaria's economy was dependent on the COMECON market. This was a group of communist countries (Soviet Union, Bulgaria, Czechoslovakia, Hungary, Poland, and Romania) that agreed to work together. This group fell apart in 1989 with the fall of communism in Europe. While this was good for personal freedom, it was too much of a change for the businesses and jobs. Also Yugoslavia, their neighbor, fell into a civil war as their country broke apart, and that did not help Bulgaria. Living standards fell by 40 percent as people lost their jobs and their savings were not worth much, and even some newborn babies were sent to orphanages when their parents could not take care of them. In 1994 Bulgaria had a short economic boom. But that slowed down in 1996 from bad finance deals and other banking problems. In 1997 there was high inflation (the money could not buy as much as it did before). Retired people had little income (their pension did not go up as fast as inflation did) and their savings were not worth very much. Many retired people were begging in the streets for food. But since then the economy has grown steadily. People from outside the country started putting money into businesses and houses, and Bulgarians learned how to make their own businesses. Today Bulgaria has Europe's lowest income and corporate tax, 10 percent for both individuals and businesses. This makes Bulgaria a very good place for business. Bulgaria also has skilled and educated workers. The average monthly salary in Bulgaria is still cheap at 400 euro or $541 USD. The state no longer has free health care. This system has been replaced by an insurance plan that people pay for, and drug costs are based on income. Private health care is encouraged nowadays. Help for people who lose their jobs is no longer automatic, but some help is available, based on family status and length of unemployment. The retirement age for men is 63 years and for women 60 years. 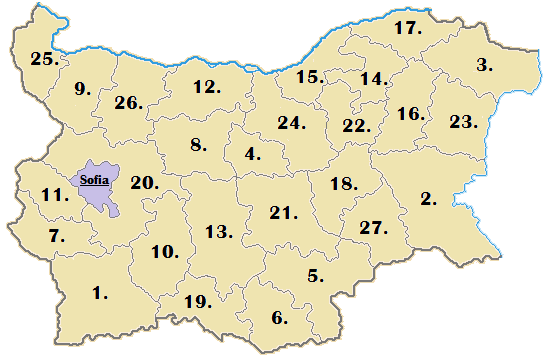 Since 1999, Bulgaria has been divided into 28 provinces or regions. Each province is named after its local capital. The provinces are divided into municipalities, there are 264 in total. There are 6 Bulgarian development regions of 27 smaller provinces. See List of settlements in Bulgaria for a list of all large locations. In Bulgaria there are 5,664,624 citizens of Bulgarians, 1,200,000 citizens of Turks and 800,000 Citizens of Roma/Gypsies. 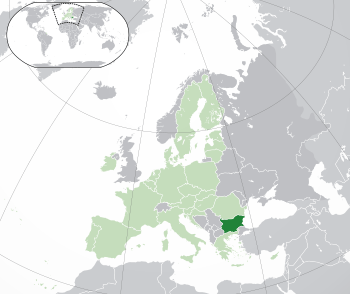 Bulgaria is classified as an development country by the EU. Bulgaria Facts for Kids. Kiddle Encyclopedia.